In one condition single participants had to simply divide the space up into different labeled categories. In another condition, participants had to play a communication game. Participants communicated in pairs using the same semantic space. In both conditions, participants were given nonsense words to label their categories. Participants could assign as many categories as they liked. In the communication condition one participant was the sender and one was the receiver. 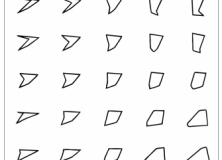 The sender chose a word to communicate a given shape from the grid above, and the receiver had to chose which shape they thought the word referred too. Participants were then given feedback as to whether the receiver had chosen the right image. 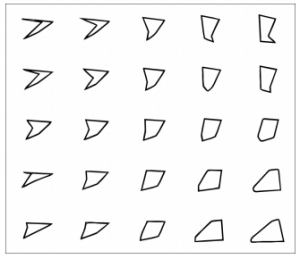 They were then given a score based on how close the chosen shape was to the original given shape. The sender and received swapped roles every trial. Together they labelled every shape 4 times throughout the experiment and the last label for each shape chosen by both participants were taken for analysis. 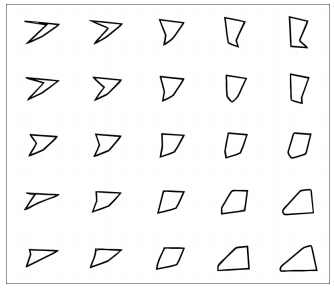 An optimal categorisation strategy within this game would be to give every shape its own label, however, memory constraints are likely to stop participants using this strategy. Given that you will score more if shapes are closer, it was expected that participants would use small, clustered and equally sized categories in order to optimise getting the right shape, and if not, maximising their score. In the non-communicative experiment, participants arranged the categories in fairly balanced chunks that would have served relatively optimally for the communication game. However, despite expectations, participants in the communicative condition behaved sub-optimally and did not maximise their communicative success (their score in the game) in that their categories weren’t clustered or optimal in colour or size. This could have been caused by the communicative condition having extra pressure for the learnability of categories, as well as a pressure for communicative success, which the non-communicative condition did not have. The authors argue that this is possibly a demonstration for how real languages arrive at suboptimal categories, e.g. where words vary as to whether they represent a very small category or represent a much broader part of the semantic space. That’s an interesting set of examples over which to form concepts and communicate about them. Anyone interested in going to town on those experiments (as it were) should look at Peter Gärdenfors, Conceptual Spaces: The Geometry of Thought (MIT 2000), which explores such arrays of objects using the mathematical concept of dimension. Note that Gärdenfors’ notion of conceptual spaces has little to do with the ideas advanced by Fauconnier and Turner in cognitive linguistics; it’s also a deeper idea. Next Next post: Cultural Evolution, So What?